Hoarding is a serious health hazard that affects over 1.4 million people in the United States. It is considered a form of Obsessive-Compulsive Disorder otherwise known as (OCD). There are many types of hoarders that include buying things needlessly, saving junk because they’re afraid to throw it away, and the worst is animal hoarding. Many times this requires special waste disposal resources and this is where our professional hoarding cleanup team comes in. 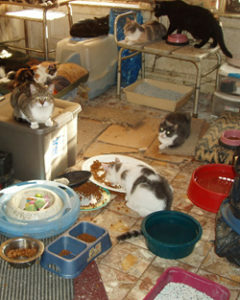 Animal hoarding is by far the some of the worst situations of hoarding because of the number of animals a person has, the smell and gross filth involved with it because of not keeping the environment clean. This becomes a health hazard, not only to the animals but to the person living in this situation. CALL or Contact Clean Keepers…We Can Help Get Their Environment Back To A Healthy state with our Hoarding Cleanup professionals!